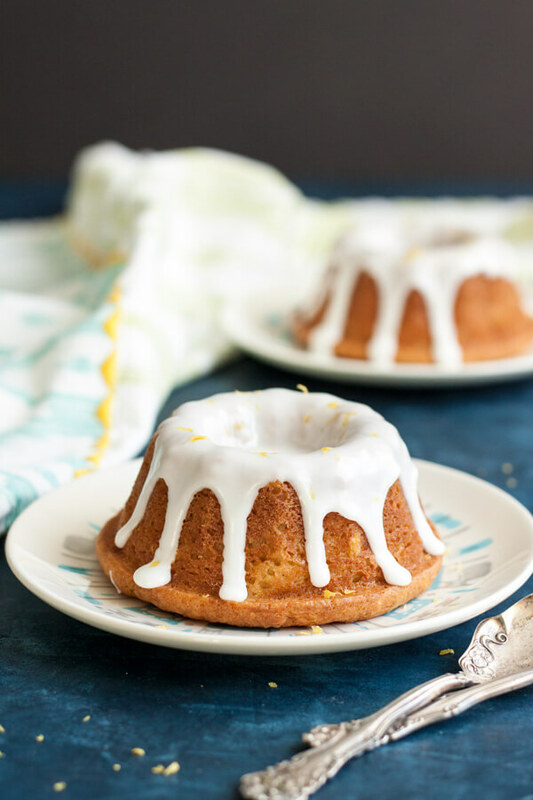 These Mini Lemon Bundt Cakes may be mini, but they pack a big punch of lemon flavor, from the cake batter all the way to the icing. They’re moist, sweet, tangy and refreshing, everything you will love. I love to eat cake but I don’t typically bake an ENTIRE cake loaded with frosting and decoration. That’s definitely on the to-do list, but I have always preferred the single serving and mini kind of cakes. 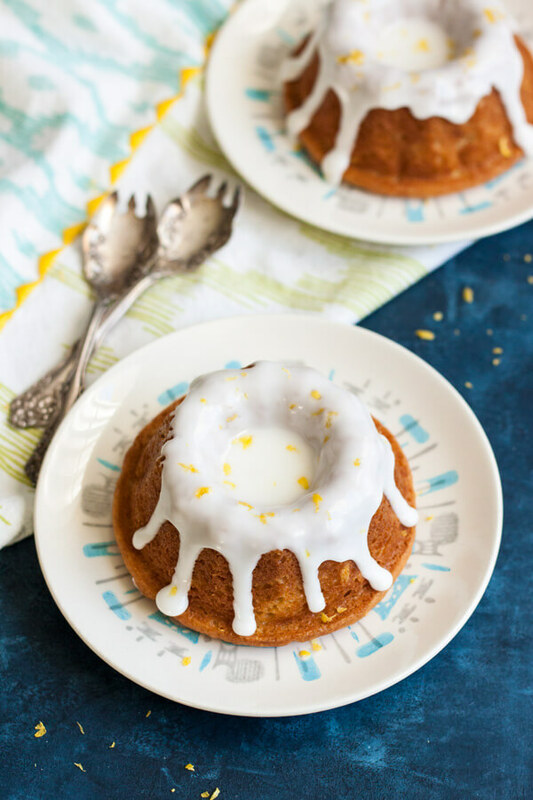 So when I scored this set of four 5 inch bundt pans from TJMaxx for just a few bucks, I had to make these Mini Lemon Bundt Cakes. You’ll need a set of four 5 inch bundt pans or similar for this recipe. You can also use smaller size bundt pans if that’s what you have, just be sure to reduce baking time in this case. Plain greek yogurt can be used as substitute for the sour cream, I have used both successfully in various cake batter. Icing thickness and tanginess can be adjusted as desired by varying the amount of powder sugar. 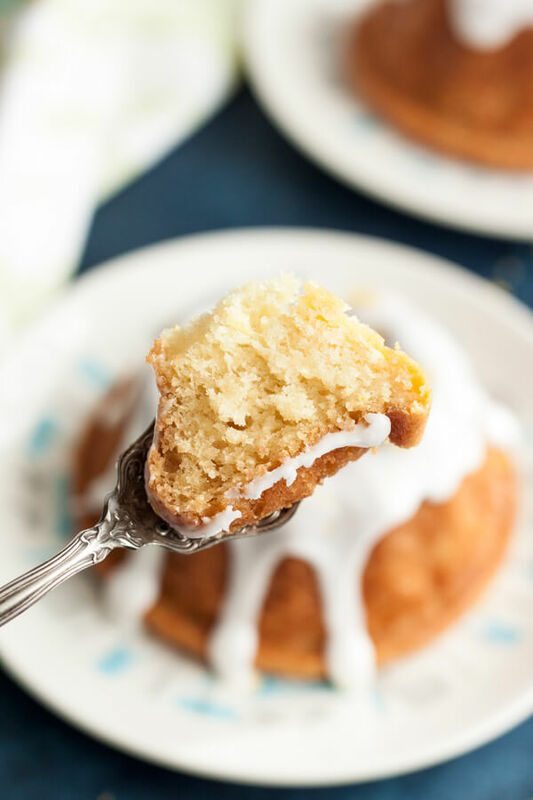 Loaded with lemon zest and lemon juice in the icing, these Mini Lemon Bundt Cakes pack a big punch of refreshing lemon flavor. The sour cream in the batter keeps the cake extra moist, there is nothing worse than a dry cake I tell ya! 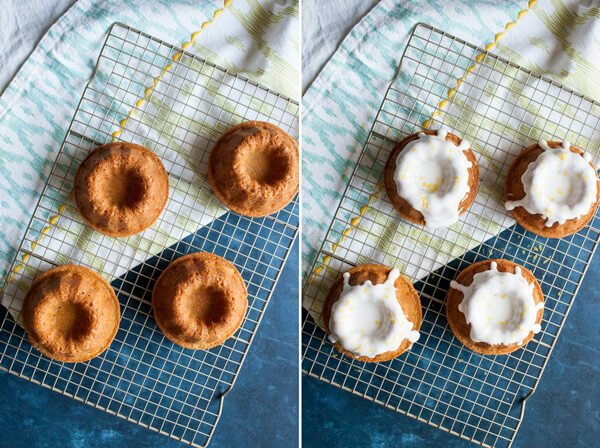 These little bundt cakes will leave you smacking your lips and wishing for more. 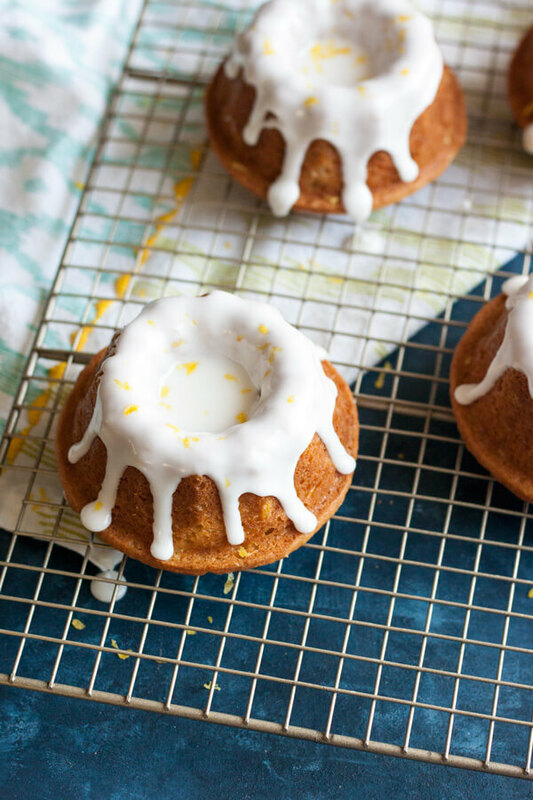 If I may say, there is no better way to welcome Spring than a batch of these delicious Mini Lemon Bundt Cakes! Let all refrigerated ingredients come to room temperature, that includes butter, egg and sour cream. Measure out flour, salt and baking soda into a small bowl, mix well to distribute thoroughly. Add sugar and lemon zest to the stand mixer bowl, rub together until fragrant and sugar turn a light yellow. Add soften butter to the sugar mixture and beat with the whisk attachment until combined. Add egg, sour cream and lemon extract to the butter mixture and beat again until combined. Reduce mixer speed to low, and slowly add the flour mixture, mix only until the flour is incorporated to avoid over mixing. Spray the mini bundt pans with a thin layer of nonstick cooking spray and divide the batter evenly among four pans. Tap the pans to level the batter. Place the pans on a large baking sheet and bake for 28 to 29 minutes in the middle oven rack. Check doneness by inserting a toothpick in the middle of the cake, if the toothpick comes out clean, it is done. Remove from the oven, and place the bundt pans on a wire rack to cool. When the bundt pans are cool enough to touch, flip them over and tap to loosen the bundt cake onto the wire rack, let cool completely before adding icing. 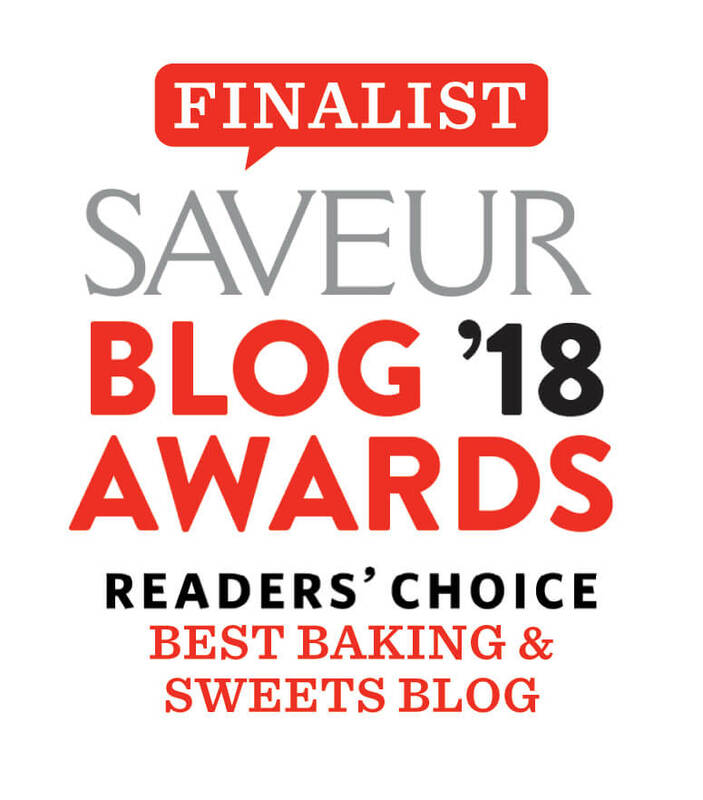 To make icing, whisk together the lemon juice with powder sugar, adjust the amount of powder sugar to achieve the desire texture of the icing, thinner icing at 1 1/2 cup and thicker icing at 1 3/4 cup. To ice the bundt cake, flip them over and dip them into the bowl of icing, then place them back on the wire rack to let the icing harden. Garnish with more lemon zest if desired. Just gorgeous and they sound amazing too. Lemon desserts are my absolute favourites. I look forward to testing this recipe out.